A really big hole. A fairly astonishing scene from the high vantage of eastbound I-44, to be sure, and it’s a wonder that an expectedly intact neighborhood like Shaw would be home to such a sizable gash in the otherwise dense fabric. A sole two-family home, at the southwest corner of De Tonty Street and Thurman Avenue, is left to bookend the 600 foot-long absence between the far eastern end of the barren half-block, and what remains of the 1920s era historic street wall at the western end of De Tonty. The five houses anchoring the southeastern corner of De Tonty and Klemm Streets offer clues as to what was recently lost on the 4100 block of De Tonty between Klemm Street and Thurman Avenue but the decrepit stature of the rather young ruin, standing alone at the southwest corner of De Tonty and Thurman, reminds us of what could become of some great St. Louis neighborhoods and has already become of so many others. Though any presumption that this really big hole signals sustained and reckless trends in attempted speculative real estate projects is misplaced, the removal of structures to make way only for options or promises is of questionable wisdom. Whatever stillborn real estate venture had the reportedly abandoned row of houses on De Tonty demolished, leaving the vacant expanse we now see, this is what has happened. We can now look at this De Tonty block and see infill opportunity, as did others in recent, unbuilt efforts. Another developer is currently attempting rehabilitation and new construction for the 4100 block, but any new proposition for this largely empty half-block site adds to the discussion of what’s there, and what should be. An immediate and full restoration of the De Tonty street wall as it’s expected to appear. The dignity of a street’s visage is not unlike the dignity of a human’s face, and a toothless mouth usually leaves an enduring, negative impression. Full replacement of recognizable, missing pieces is the patch over this hole that returns dignity to the street. The houses anchoring the southeast corner of De Tonty and Klemm Streets offer clues as to what was recently lost on what is now most of the 4100 block of De Tonty Street. A current attempt to build on this half-block site is advertised as underway. With the strictures of the Shaw Neighborhood Historic Code, pronounced deviations in the resident architectural style are not likely to be made by new infill. Whether opposed or supported, this code ensures guardianship of the rich, historic nature of the buildings and street walls that neighborhoods like Shaw strive to preserve. With the certainty of façade design virtually by prescription, focus is then redirected to the broader makeup of infill that can be proposed. Urban density is as vital to a city core’s survival as it is to its identity, and the continuance of that density is where any infill proposal should begin. Though density itself is not a generator of city or neighborhood form, but rather the result of people’s need to be near things of importance, existing or historic neighborhood density should be maintained. Density is often measured in number of dwelling units per acre, which can mean different things when considering sizes and shapes of both buildings and the lots they sit on, and of course, the network of streets and thoroughfares that connect and restrict the sizes of those buildings and lots. The pictorial book “Visualizing Density (2007, Lincoln Institute of Land Policy, authors Campoli & MacLean)” exhibits a range of different densities, from a sparse one dwelling unit per acre (du/acre) or less, to a hyper compact 150 du/acre from aerial perspective. This excellent collection of photos and brief analysis allows the reader to see many ways in which density can appear when presented in the ratio of du/acre. This northward-looking birds-eye view of the half-block site on De Tonty Street can easily be likened to the images in the pictorial book “Visualizing Density”. Mass transit usually relies on a minimum of 7 du/acre for city buses, and 12 du/acre or more for fixed rail systems to justifiably work at its cost of operation and maintenance. The placement of urban density into the context of viable mass transit is a comparison that most city-dwellers and core supporters can appreciate, for instance, and is just one way to measure the importance of density. This metric, however, does offer a numeric means of understanding the density of a region with civic services like mass transit. An examination of the area in the Shaw Neighborhood, where the 4100 block of De Tonty is located, can be made to estimate its du/acre density. Comparing this estimated density to those usually required to justify mass transit service, we can surmise that the Shaw neighborhood is a strong example of the urban form that can both demand and support transit service. 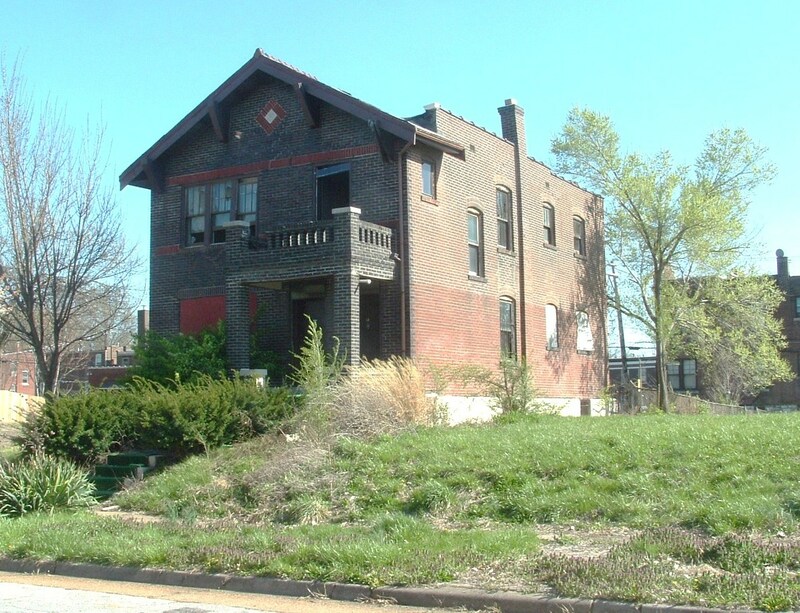 This Shaw neighborhood form should persist through preservation and appropriate infill, and can include modern installations or functions that may not have been a historic part of its existence, but still fit into the pattern. 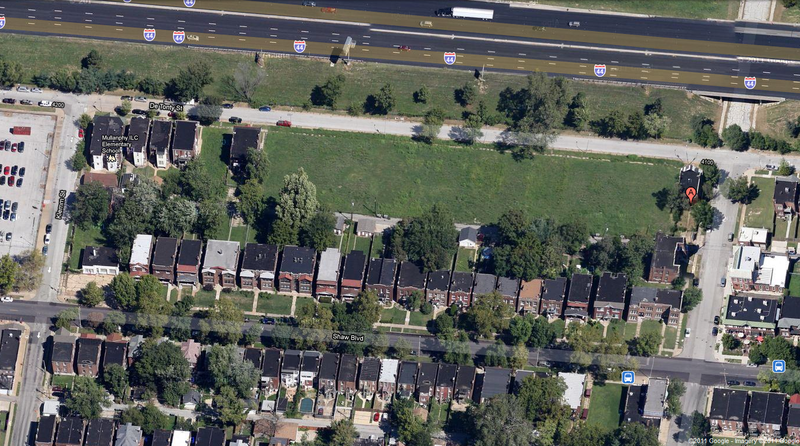 An aerial view of the block immediately to the south of the 4100 block of De Tonty Street is representative of the existing density of the Shaw Neighborhood. An examination of this block shows its density to be approximately 12 du/acre, which is in the range of the minimums required to sustain fixed rail transit. 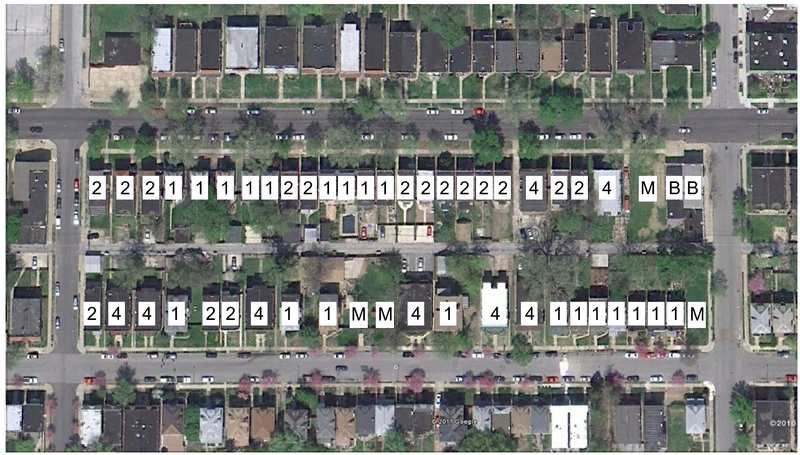 Each building on this block is labeled per the number of residential units within (1, 2, or 4), or whether it is a business (B). 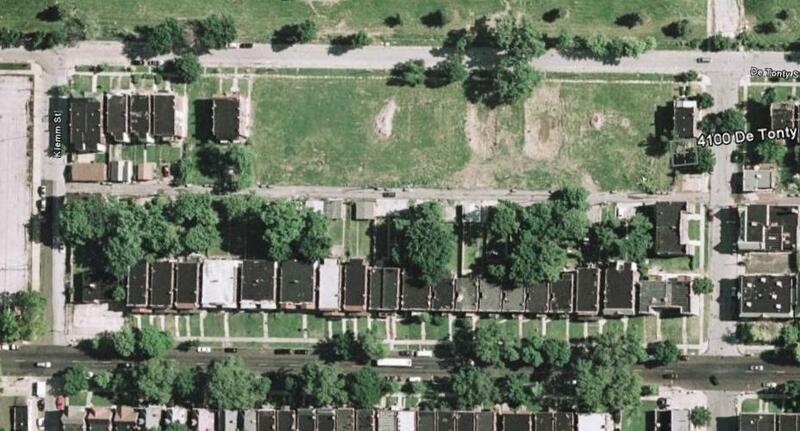 Vacant lots are labeled ‘M’ for missing building. The area of this block is approximately 356 feet x 820 feet = 291,920 square feet.. With 43,560 square feet per acre, this block is 6.7 acres in area. A total of 84 dwelling units have been counted and therefore 84 du/acre divided by 6.7 acres = 12.5 du/acre. Comparing an aerial view of the current conditions on the 4100 block of De Tonty Street to the aerial view of the block immediately to the south, it’s easily seen how such a huge hole in the neighborhood fabric is a shock to this dense neighborhood. The best solution is an immediate and full restoration of the street wall by filling in the hole to at least the historic density that was recently lost. URBAN: The closely spaced houses along Shaw Boulevard on the southern edge of the block bounded by De Tonty and Klemm Streets, Thurman Avenue and Shaw Boulevard, represents the intact density covering nearly the entirety of the Shaw Neighborhood map, and it’s unquestionably urban. RURAL: Compared to the southern edge of the block, the northern edge, along De Tonty Street, could be described as rural when considering the naturally contrasting density of urban neighborhoods like Shaw. 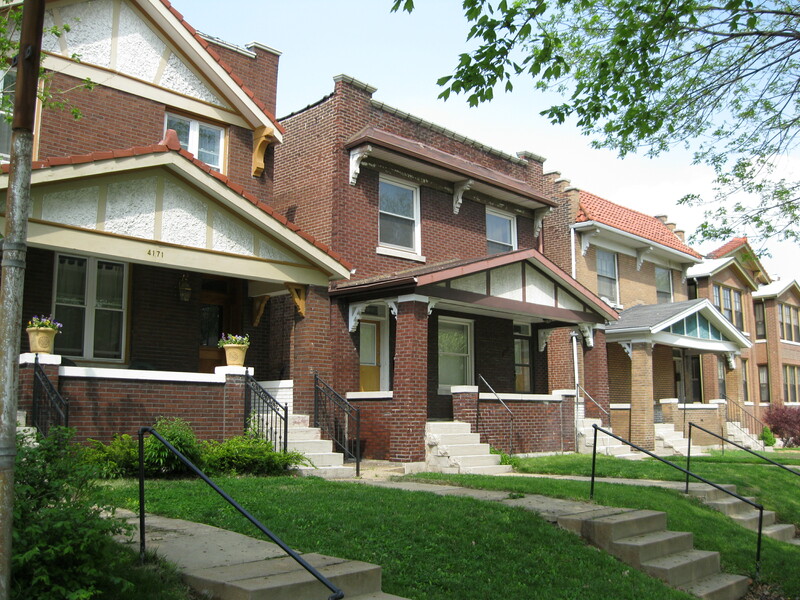 In addition to the general density of historic neighborhoods like Shaw, there are the proportions of façade area and space between buildings that compose the city street wall, and this is too often eschewed in favor of patterns more becoming of suburban areas rather than urban areas when new residential infill is built in St. Louis. Though the intent is often to provide more opening for daylight to penetrate windows on side walls of buildings, and to provide a distance between buildings that may give a more comfortable sense of privacy to some, the visual effect is disruptive to the extant patterns established long ago. This disruption is both incongruous to the architecture of the historic street walls, and to the very du/acre density that cities rely on to maintain what is essentially urban. While older city homes are considered architecturally desirable to likely most that choose to live in cities, what may often be required to rehabilitate a dilapidated structure or to reconfigure interior spaces to better meet contemporary lifestyles can dissuade potential buyers of homes located in neighborhoods like Shaw. 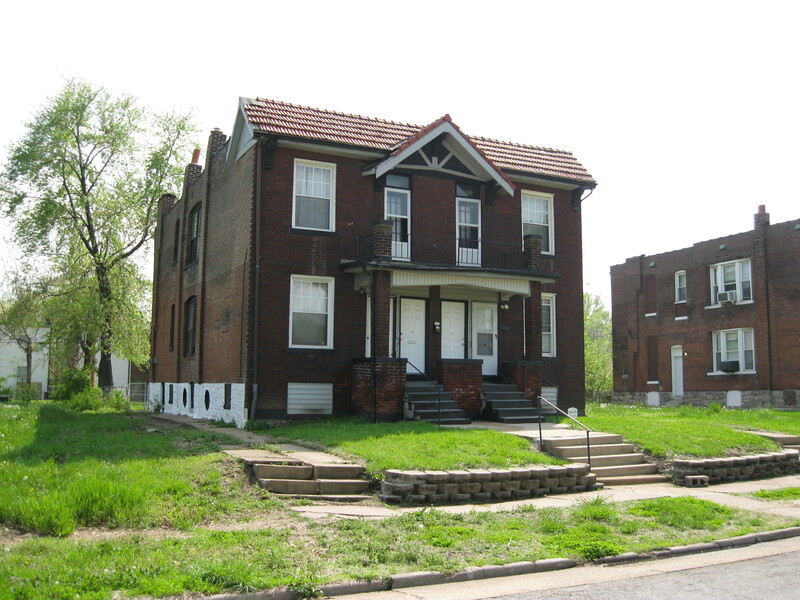 A lack of alternate housing choices may prevent historic neighborhoods from achieving the optimum demographic mix of homeowners, and acceding to both historic codes and an obligation to protect dense fabric and architectural legacy while offering alternatives is rarely attempted in St. Louis. Of course, it is easier to depart from resident architectural vernaculars when restrictive codes are not present, but it is not difficult to accede to restrictions and obligations while also offering an alternative. Acceding to restrictions of historic districts and obligations to patterns of form and vernacular is not difficult when proposing alternative housing. The advantage of systems-built architecture in multi-unit residential projects is readily apparent when economies of scale present themselves. 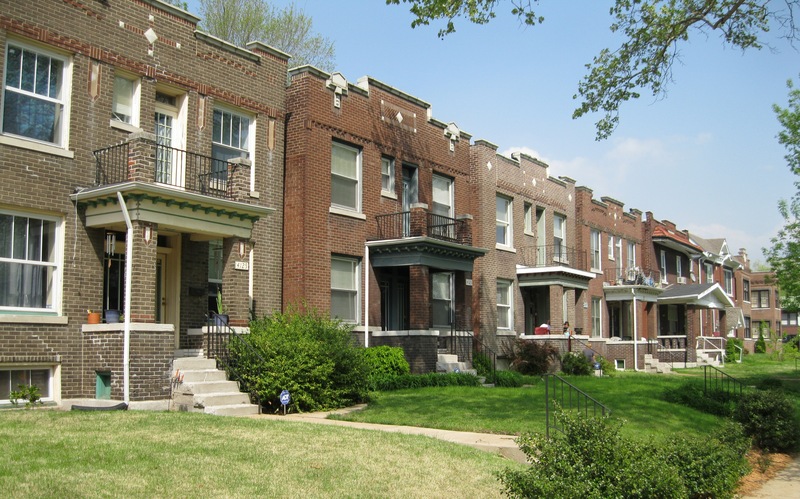 Larger, dense multi-family arrangements can be designed to appear harmonious on streets of closely spaced single-family houses or two-family townhomes and apartment houses, which is the predominant housing type in much of the Shaw neighborhood. Rhythmic street wall patterns can appear to continue where no spaces occur between houses in multi-family arrangements, allowing for both the respect of history and du/acre density that is more than adequate to support mass transit service. Systems of off-site fabrication of housing, like modular sections or panelized components make larger, compact developments more cost effective to build because of reduced construction schedule time and the economy of scale in multi-unit projects. The city of St. Louis has seen a small amount of prefabricated housing built in recent years, but this method of project delivery is underutilized considering it’s appropriateness to compact housing units and relative sizes of city residential lots. An overview of the 4100 block of De Tonty Street shows what should be in the more than 600 foot long expanse of vacancy, and that is a full restoration of the historic density recently lost at the half-block site. 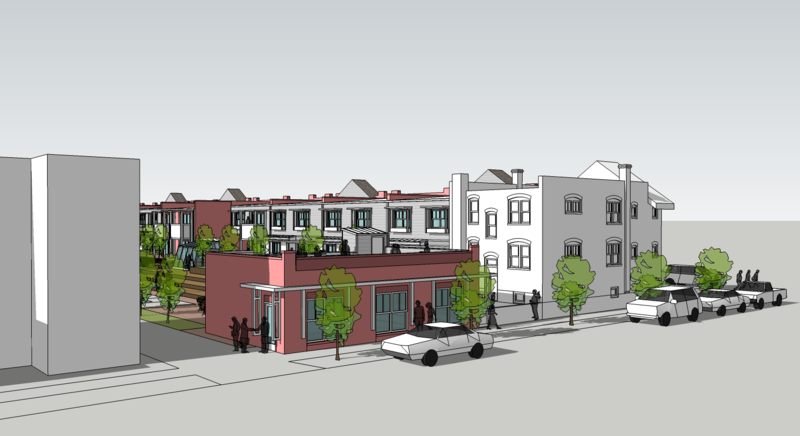 The proposal shown includes 20 new owner-occupied residential units, and an additional 6 remodeled existing rental units. Looking again at the aerial view of the big hole on the 4100 block of De Tonty Street, it’s easily seen how the 20 new infill and 6 remodeled residential units meets or exceeds the historic density that is seen throughout the Shaw Neighborhood in the restoration of the full block. Taking cues from pieces of historic fabric, like the façade gable on the lone, vacant house at 4100 De Tonty Street, an infill project of the size needed to plug the hole on this half-block site settles into a streetscape lorded over by historic code. The St. Louis market can be well-served by the number of modular manufacturing plants in close range of the metropolitan area, for instance, but skepticism in a region that knows only conventional building methods is most likely dulled by projects of convincing scale. Existing houses can be incorporated into new infill to offer further options for housing like designated rental units. As seen in the view of the infill proposal above this image, existing two and four family residential houses can be remodeled and incorporated into the full street wall improvement on the half-block site, and the quality of the 1920s era building stock in the Shaw neighborhood is obviously worth the investment and care. Though rare outside of the largest U.S. cities, housing cooperatives and other shared equity arrangements like community land trusts and cohousing certainly offer type alternatives of which physical form is very amenable to a neighborhood fabric like that seen in Shaw. These housing types may offer many in the non-professional workforce or young, first time buyers an affordable option of home ownership. Shared commons can foster lasting personal relationships and offer a strong sense of security with watchful eyes and careful attendance. Appurtenances to these housing types like a meeting house or similar amenities can offer flexible use and even opportunity for profit for residents. Among the neighborhood patterns in Shaw are the many small retail buildings that allow the active street wall to continuously wrap around street corners and frame inlets to service alleys as if the alleys themselves were streets. A common meeting house, that could serve many purposes like movie nights, community events such as sales or art shows, or even leasable office or retail use is the sort of ancillary feature that is too often precluded by zoning laws unfriendly to dense, historic neighborhood form. Shared commons like a meeting house with an outdoor court, or even green roof with planting beds can provide for both the residents of compact housing arrangements, but also to the neighborhood at-large. The existing house at 4100 De Tonty is seen at the southwest corner of De Tonty Street and Thurman Avenue, where the common meeting house would occupy its one-time backyard space along the western side of Thurman Avenue. Urban agriculture is both ancient and seemingly brand new, with current focus on sustainable land use and more healthful human consumption of foods so prominent in city development issues and design. 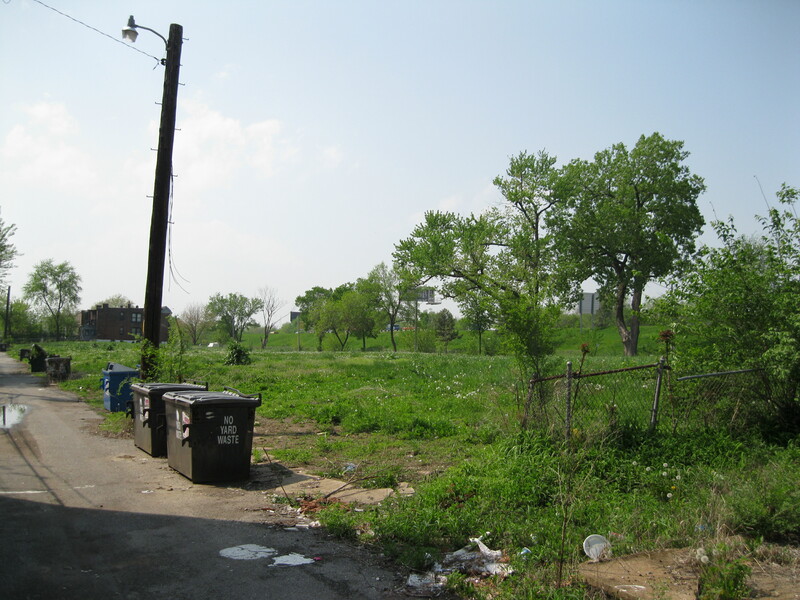 While efforts are made of late to describe the phenomenon of food deserts, the presence of managed agricultural growth in dense city environs should not be limited only to crisis response or larger-scale commercial operations. With the solar exposure to the south, the half-block site offers a natural solution to agricultural crop plantings, and the terraces step down to alley parking from semi-private garden and yard spaces elevated to the main floor level of the residential units. Community gardens are often unifying if not always capable of delivering the volume expected to provide many with nourishment, and urban farms can proliferate at large and small scales throughout city neighborhoods. If integrated into domestic architecture as matter of standard practice, rather than oddity, then that proliferation of urban agriculture would be many multiples of the few community gardens that occur where they’re welcomed. The topographical gradation creates a subtle transition from the buffering zone of crop plantings to direct outdoor relationship of the private gardens and yards to the living spaces inside each unit. The more than 600 feet of expanse to be filled requires a solution that provides intermittent breaks like through-passages between moderate building lengths, projecting units and accessory structures like greenhouses to relieve redundancy and provide for comfortably scaled enclaves. The cultivation of produce can be profitable and instructive, and encourage good stewardship of land through interested and regular human involvement. The integration of agriculture into domestic architecture can ensure a constant, custodial presence for the needs of a functioning farm. Cities should give serious consideration to more sustainable, permacultural land development practices, and to allow for mixed uses and even producing more than is consumed. The integration of agriculture into urban architecture can coexist with residential life. With what’s there, one is compelled to propose what should be, and to fill the really big hole on De Tonty Street with an alternative housing type that meets or exceeds the du/acre density present in the Shaw neighborhood, accedes to historic code and an obligation to protect extant patterns, and provides an illustration of the integration of urban agriculture into domestic architecture is just such a proposal. 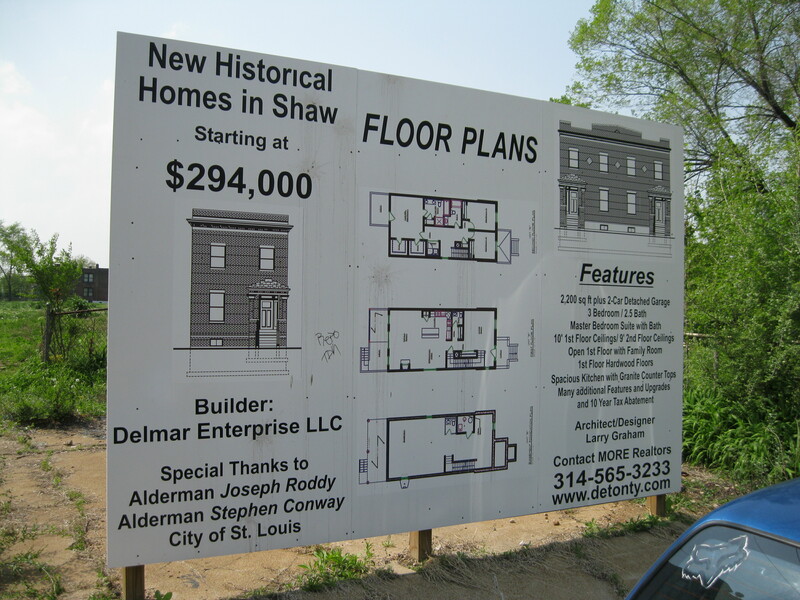 Through the system of prefabricated modular components delivered to this urban site en masse, the quickness and efficiency of restoring the dignity to the De Tonty street wall in the historic Shaw neighborhood can introduce to the city a new way to build. This great neighborhood expects intactness in stark contrast to the void on this half-block site, and because of the astonishing impact of what’s there, it can be said what should be. Excellent post! I truly enjoyed reading this. Thanks Jim… much more to come. well? This could be a issue with my internet browser because I’ve had this happen before. I’m not sure what the problem could be, other than your browser. Do you have a smart mobile device? Thanks a lot and I’m taking a look forward to touch you. Will you kindly drop me a mail? free software means that you will get a program that will actually deal with your gadget. You can use articles as a web page traffic generator. blogger but I’m still new to everything. Do you have any tips for inexperienced blog writers? I haven’t updated this blog in years (last post of mine was in 2012) but it’s nice to see someone run across it. This blog used to be carried by the urban design website called “NextSTL” and will occasionally use the blog name to post similar-themed articles (Alex Inhen did just that this week) for What Should Be, and I hope to again start posting content soon. I don’t really have any tips that come to my mind other than if you like to write copy and create original content like I do, all that was necessary was the WordPress template. I’m certainly no pro, and would be interested in hearing what your blog theme would be.